Congratulations! You’ve created a tool for LabVIEW and are ready to license it. National Instruments has done the legwork to offer you several well-tested options to fit your every need. The NI/SoftwareKey.com partnership offers extensive options with all sorts of flexibility and streamlines the task of licensing. We want you to get your tool(s) in the hands of users as quickly as possible, all the while using the smartest licensing toolkits available! Select the best solution for licensing and distribution, following the guide presented below. (This guide applies to developers using LabVIEW 2010 or later). A LabVIEW library is a set of VIs that extends the functionality of the LabVIEW editor, also referred to as an add-on. 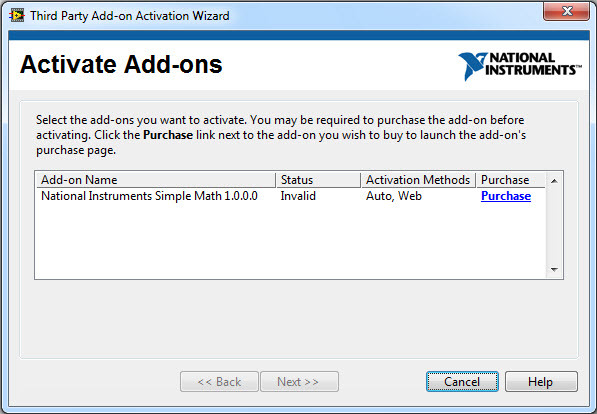 We recommend using the Third Party Licensing and Activation Toolkit (TPLAT) created by National Instruments. 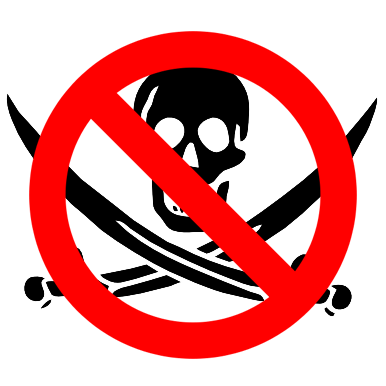 Once a library is licensed on a development workstation, this user can export the code to a DLL, EXE, etc., and no additional licensing checks are performed (royalty-free run-time license). 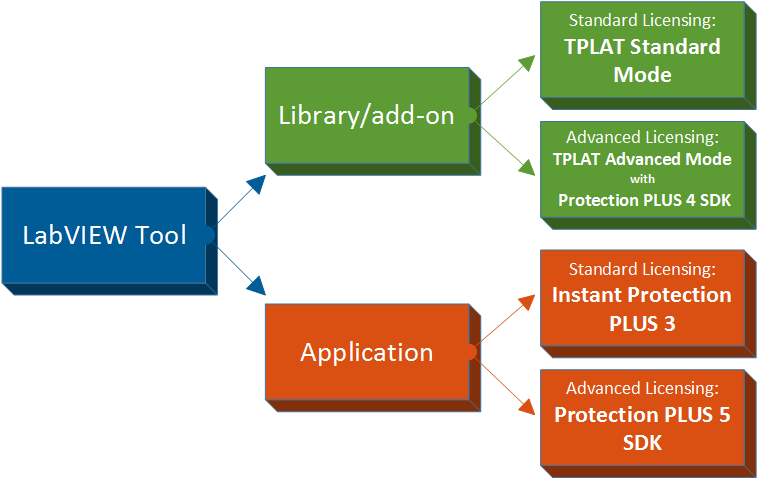 If you are happy with standard licensing functionalities such as a 30-day evaluation period, requiring online activation over the Internet, and a royalty-free run-time license, then the TPLAT Standard Mode is all you need. The cost is free for LabVIEW Tools Network Partner Developers. You can centrally manage your licenses on a complimentary SoftwareKey SOLO Server1 license management account supplied by National Instruments. Optionally, you can centrally manage your licenses using SoftwareKey SOLO Server1 (additional purchase). Similar to licensing a library, licensing a LabVIEW application has both a standard and an advanced mode. Both approaches require purchasing a component of the SoftwareKey System. Tapping into thousands of lines of licensing code is quick and easy work with Instant Protection PLUS 3. Akin to a paint-by-numbers set, the step-by-step guidance of the implementation wizard will have you on your way with little to no source code changes. You are able to protect 32-bit and 64-bit Windows executables via the easily accessible Instant Protection PLUS DLL & API. You can customize your solution from a host of options representing the most commonly requested licensing needs. For the most complex licensing needs, we are proud to announce the new Protection PLUS 5 SDK LabVIEW Edition! This is an exciting, all-new, built-from-the-ground-up addition to the SoftwareKey family of software licensing solutions. This solution consists of application programming interfaces (APIs) to give your development team complete control and flexibility over the licensing business logic and user interface. Your development team has a blank canvas and the APIs are their palette and paintbrush. The new Protection PLUS 5 VIs make it easy to call and harness the power of the Protection PLUS 5 Native Edition library, including support for additional platforms (such as Windows, Mac OS X, and Linux — both 32-bit and 64-bit architectures) with the same API! For a more detailed comparison between Instant Protection PLUS and Protection PLUS 5 SDK, see our blog post THE DECISION: Instant Protection PLUS 3 or Protection PLUS 5 SDK. Regardless of whether your tool is a LabVIEW library/add-on or application, using TPLAT or the SoftwareKey System products, you can offer your product(s) on the LabVIEW Tools Network. Get started TODAY with an exclusive offer for LabVIEW developers! 1SoftwareKey SOLO Server is specifically designed to work with Protection PLUS 4 SDK and TPLAT for centralized management of your customer’s licenses. Together, they create the advanced solution that is the flagship of the SoftwareKey System. You get the most powerful overall solution driven by combined technologies: the speed of traditional software e-commerce, the hands-free automation of electronic license activation and management (ELA/ELM), and centralized controls to manage license enforcement. Any of the SOLO Server hosting options are available to you. 2Note that although Protection PLUS 5 SDK is currently the latest version, both TPLAT Advanced Mode and TPLAT API require a full license of Protection PLUS SDK Version 4 from SoftwareKey.com. Get the latest licensing tips and strategies to help you increase revenue, save time and reduce costs when using any form of licensing system. Mike Wozniak is one of the co-founders of SoftwareKey.com and responsible for marketing, content and product strategy. When he isn't plotting new ways to help customers solve licensing and business automation challenges, he likes to travel and entertain guests who come to visit the Orlando area. He also writes most of the licensing tips here. 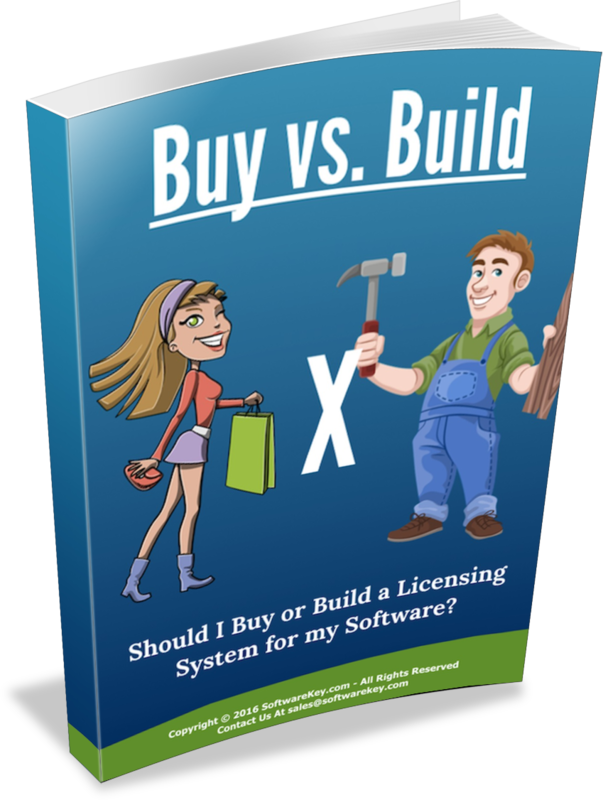 FREE REPORT: Should I Buy or Build a Licensing System for my Software? Whether you are a Software Developer or Manager, download this free guide to help you decide. What is Cloud-Controlled Network Floating Licensing?